The global industry for Voice over IP is one of the most interesting technology markets for industry analysts. A recent forecast shows that the worldwide VoIP market will continue to show strong growth in 2019 and beyond. Market Research Future has recently published a study with insights for the Internet Telephony market over the next four years, up to 2023. 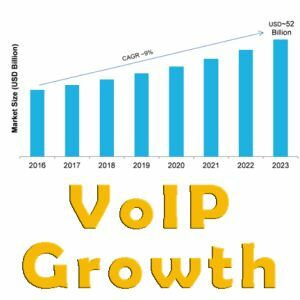 This study showed that the global VoIP market will continue to expand, reaching USD 52 Billion by 2023, at 9% CAGR. The IP telephony market is not just growing, it is accelerating. IP telephony is slowly becoming an integral part of day to day operations in modern day organizations. IP telephony provides better connectivity and mobility, along with significant cost savings on phone calls. Nearly all forms of business and technology are shifting towards both web-based and mobile delivery. VoIP ties right into that trend, as both businesses and consumers are looking for added flexibility and cost efficiencies for telecom. Cloud-based solutions (such as Telinta’s TeliCoreTM softswitch and billing platform) makes it easier for service providers to enter the market without needing to deploy their own hardware and software. Hosted PBX, SIP Trunking, WebRTC, Mobile OTT calling from a smartphone app, and other VoIP services bring significant benefits to users — and this translates into profits for ITSPs and VoIP service providers. Since 2002, Telinta has enabled Internet Telephony service providers around the globe to participate in the fast-growing VoIP industry. Our white label solutions integrate hosted switching and billing, helping VoIP service providers and their resellers to easily control their own branding, pricing, service bundles, and more. How can you participate in the fast-growing opportunity for VoIP? Contact us to learn more.